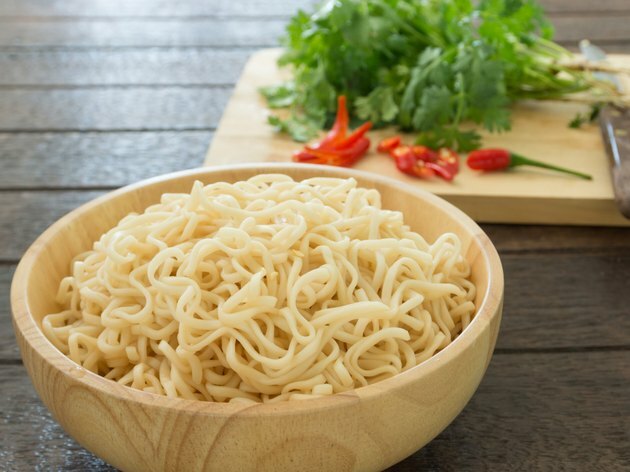 Oodles of Noodles, which are ramen noodles packaged with a variety of seasonings and sold by Nissin Foods, provide a quick, easy and inexpensive meal. Oodles of Noodles are precooked and sold in a block, so cooking them involves nothing more than rehydrating with boiling water. But even a simple product can be cooked in different ways to increase its nutritional value and decrease its high sodium count. The Oodles of Noodles package contains two servings, so take that into account when figuring calories and other nutrients. Oodles of Noodles are easy to cook in the microwave. Place the noodles in a microwave-safe dish after breaking them into chunks and cover the noodles with water. Adjust the amount of water, depending on whether you want more soup or primarily noodles. If you barely cover the noodles with water, you get very little broth. You don't need to add the seasoning before putting the noodles in the microwave. Cook on high for three minutes, according to Nissin. Remove from the microwave and let sit for several minutes to finish cooking, especially if you want your noodles mushy. One advantage of cooking in the microwave is the noodles are already in the dish and ready to eat when you remove them. You can also heat Oodles of Noodles on the stove. Bring water to a boil, drop in the broken-up chunks of noodles, cover the saucepan and turn the heat down to medium. Cook for two to three minutes. Make sure you have enough water in the pan to prevent the noodles from sticking. The noodles separate as they cook and turn translucent. Add the seasoning during or after cooking, but if you add while cooking, stir well so the powder doesn't clump. One of the main criticisms of ramen noodles is high sodium content. One package of Oodles of Noodles Oriental flavor supplies 487 milligrams of sodium, a large percentage of the recommended 2,300 milligrams or less of sodium per day, according to the Mayo Clinic. High sodium intake may contribute to high blood pressure. Since the seasoning is packaged separately from the noodles, you don't have to use the entire packet to season your noodles. Using just one-quarter of the packet will reduce your sodium intake to a more reasonable 240 milligrams per serving. The seasoning packet contains two servings of seasoning, an important fact to remember when figuring sodium intake. You can dress up ramen noodles by including your choice of vegetables, small pieces of meat, egg or any additional seasoning that appeals to you. You don't have to use the seasoning that comes with the package. A single serving of ramen noodles contains 190 calories, 28 grams of carbohydrates and 4 grams of fat, with 3 grams from saturated fat and 4 from protein, according to Nutrition Resource.